Like a lot of people, I don’t answer the phone anymore. Anyone in my personal life who needs to find me knows to text, email, or contact me via social media. If the phone is ringing, it’s 98% likely to be a telemarketer. The phone rang last night and I stupidly answered it because…. well, because I was having a stupid episode. And yes it was a telemarketer. All of which is to introduce today’s topic, which is “fun scams that folks have tried to pull on me.” There are many of them. And I’m not to ashamed to admit that some of them have actually worked on me. We’ve all had moments of vulnerability in our lives, during which we are most apt to abandon common sense and leap at an offer that is literally too good to be true. I’m not experiencing a moment of vulnerability right now. 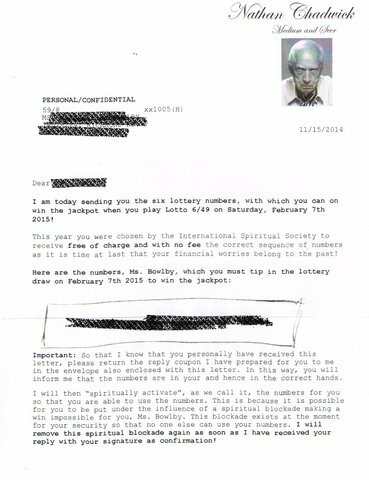 Hence, the most recent scam offering is little more than a curiosity… but a hilarious one. 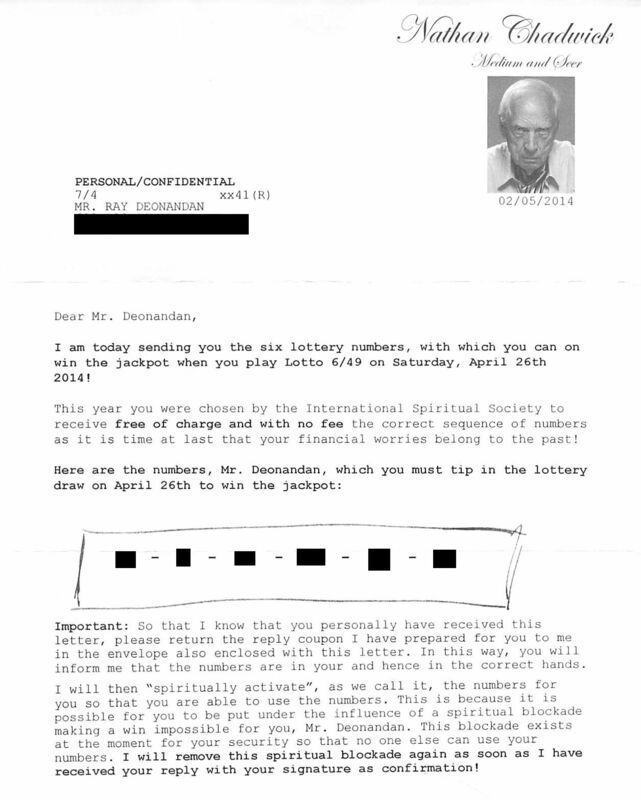 The long and short of it is that Mr Chadwick, by virtue of his special powers, has identified for me the winning numbers of the upcoming April 29th Lotto-649 draw. But he has put a “spiritual blockade” on me, which prevents me from winning this lottery unless I furnish him with something. This is a new kind of extortion, and I congratulate Mr Chadwick on his creativity. But what is it that he requires from me, in exchange for which he will unleash torrents of unimaginable wealth? All he wants is for me to return to him a coupon confirming that I received this letter. Whaaa? How is that extortion? Well, I’m also supposed to sign said coupon. 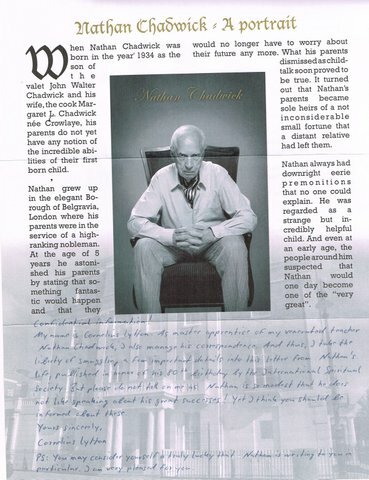 So Nathan Chadwick wishes to extract from me both confirmation of my address and identity, as well as my signature. 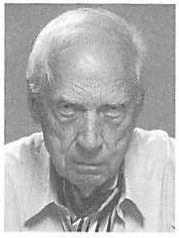 A quick web search of “Nathan Chadwick” reveals this name to have been used in multiple “psychic” scams all over the continent. Most commonly is his provision of an unsolicited “gift”, which is followed my multiple demands for payment. A truthful but vulnerable individual might be cowed into sending payment for this “gift”, for fear that they had somehow legally agreed to its purchase through some aspect of the mail transaction. There’s probably some fine print associated with the signed “coupon” that provides flimsy legal support for this position. And who can doubt the veracity of this lovable face? 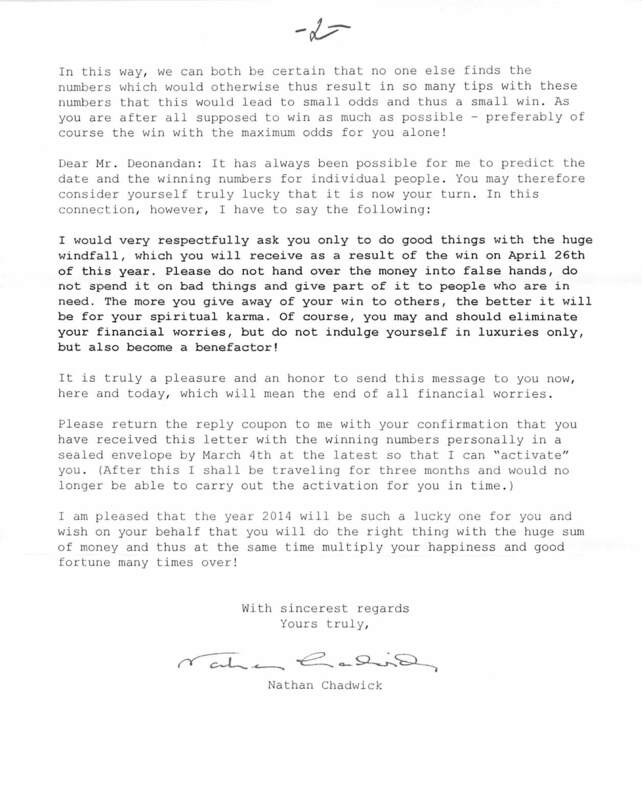 By the way, I have digitally removed my address and the winning lottery numbers from the image above. The first is to protect my privacy. The second is because I fully intend to use these numbers in the lottery anyway. So stay tuned, and we will find out if I am indeed “spiritually blockaded”. 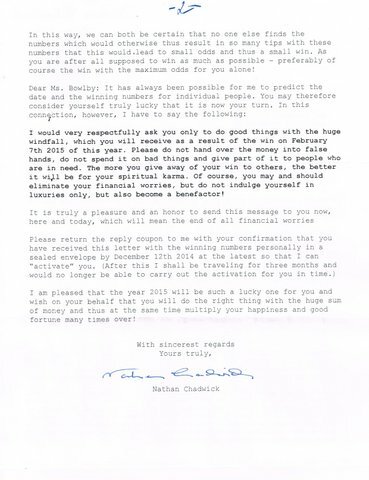 UPDATE (Dec 15, 2014): Margaret, a visitor to this blog, kindly wrote to inform me that she, too, has been contacted by Mr Chadwick, whose letter included a handwritten note from one of his “students” indicating that Margaret was “someone special.” She also said that she had been contacted by “Pastor Peter Popoff”, who is engaged in related questionable activity. Stay vigilant, friends!